Over the last few years, Cone Beam 3D imaging has become more widely adopted in dental offices. The information delivered by this technology creates invaluable data for the treatment and implant planning process. 3D scans used in conjunction with 3D implant planning software represent an optimal method for presurgical assessment of dental implant sites. Specifically the use of 3D technology during any augmentation or implant procedure allows clinicians to examine cross-sectional views of the site of interest. 3D imaging provides an extensive amount of information for the clinician, such as bone structure, bone density, root positioning, fractures, and clear measurements of the anatomical structure. Both doctors and patients alike can visibly understand the precise diagnosis, method of entry, treatment and recovery. Dr. Norberto Velázquez in Greenville, NC shares his experience with the Gendex GXDP-700 Pan/3D imaging system and talks about why 3D Imaging makes implant planning more predictable. The case presented represents a typical instance where an implant is required in the area of the first or second premolar. A three-dimensional scan is used to accurately locate the exact position of important anatomic structures or landmarks. The 3D scan and software allow moving, slicing, and viewing the anatomy from any direction. A critical step is the ability to mark the position of the nerve (marked in red in the images below) — this becomes especially helpful when virtual implants are used. A first look might indicate that the implant on this image (1) could interfere with the inferior alveolar nerve and mental foramen. This is not the case. This image (2) is a disto-facial view of the 3D scan showing appropriate clearance between the implant, inferior nerve, and the mental foramen — as indicated by the mint circle. In addition, the Invivo5 software provides a visual indication of such clearance by coloring green the implant model in the lower left of the screen. The arch section of the software shows axial, sagittal, and coronal slices. Multiple views (3) provide a more comprehensive understanding of the anatomical features of the patient. After surgery, a follow up with a post-operative image (4), either 2D or 3D, can be done based on case necessity. The GXDP-700 system offers several functionalities that benefit my patients. The advantage of the extra dimension to both implant patients for me, and orthodontic patients for my wife, is incalculable. This machine has become a basic part of the diagnostic process for implants — like my explorer and mirror. It allows me to see the location of important anatomical structures and landmarks so I can avoid additional or unnecessary invasive procedures. 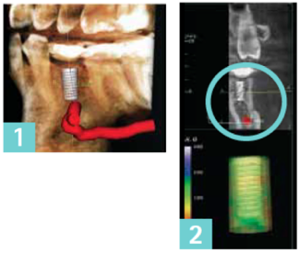 With the scan, I can inform patients of my implant treatment plan, and show them how the surgery will proceed. They gain confidence in my knowledge of their dental anatomy even before surgery begins. Before 3D, a surprise could pop up during surgery. Then, the patient would be disappointed that he or she was not going to get an implant immediately, but needed an additional procedure first, such as grafting. My patients understand that I have implemented this technology for the sake of their dental health. For a dentist, the opportunity for improved diagnostic capabilities is always a benefit to the patient. While they are not always directly aware of all the advantages, the information that I obtain from these pans and scans is beneficial for their care. I witness these benefits every day, in increased patient communication and more successful treatment outcomes. Dr. Velázquez graduated from dental school in 2002 and attended a general practice residence (GPR) in Oklahoma City, Oklahoma from June of 2002 until June 2003. Shortly after finishing the GPR residence, Dr. Velázquez moved to Greenville, NC and worked in Kinston for the J.H. Rose Dental Clinic as the Dental Director for four years. Dr. Velázquez has advanced education in implantology and enjoys working on cosmetic procedures, oral surgery, crown and bridge (prosthetics), implants, and dentures. He just finished another intensive implant course. Your clear path for growth begins with the GXDP-700™ Series. This dynamic system starts with a digital panoramic with sophisticated styling and an ergonomic design including an advanced touchscreen interface. The GXDP-700 is a modular system, upgradeable from 2D panoramic to Cephalometrics or 3D Cone Beam with flexible field-of-view, or both. Why Choose the Gendex GXS-700 Digital X-ray Sensors? Get the latest news on Gendex products, events, and offers.